Our paper in Nature Ecology and Evolution can be found here. Organisms frequently alter their behavior, physiology, and/or morphology in response to changes in their environment (i.e., they exhibit phenotypic plasticity). Along with my Ph.D. advisor, David Pfennig, I recently developed a set of criteria and an experimental framework for evaluating whether and how such phenotypic plasticity could initiate an evolutionary sequence leading to novel adaptive traits (Levis and Pfennig 2016). Using this framework, our paper investigated plasticity’s role in the origins of a novel, complex phenotype in spadefoot toad tadpoles. This project started after I read Developmental Plasticity and Evolution by Mary Jane West-Eberhard. While West-Eberhard lays out a compelling argument and abundant evidence for her theory of adaptive evolution, it is difficult to find explicit predictions in her 800 page book. As a project for an evolutionary biology class that I took during my first year as a Ph.D. student, I collated and synthesized all of the specific predictions I could find in Developmental Plasticity and Evolution. Ultimately, these predictions formed the basis for the paper mentioned above on the “plasticity-first” hypothesis of adaptive evolution that I prepared with my doctoral advisor. Formally, “plasticity-first” evolution is a sequence of adaptive evolution whereby environmental perturbation leads, via phenotypic plasticity, to developmental reorganization (via, e.g. altered gene expression) and uncovers cryptic genetic variation for, and ultimately production of, a novel developmental variant (i.e. trait) that is subsequently refined into a fully functional trait through a process West-Eberhard dubbed “genetic accommodation”. With clear predictions and a solid understanding of the theoretical basis of plasticity-first evolution, we were ready to empirically evaluate this hypothesis. 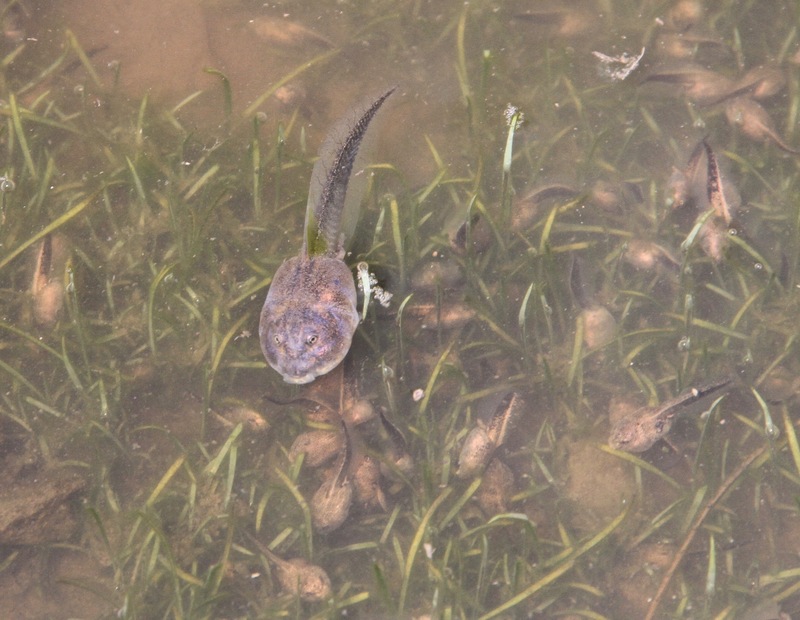 We investigated the possibility of a plasticity-first scenario contributing to the evolution of a novel carnivore ecomorph found among the tadpoles of North American spadefoot toads. This form is an evolutionary novelty, restricted to the genus Spea, which allowed these amphibians to switch from their normal diet of detritus, algae, and small crustaceans to a more nutritious, but underutilized resource: large anostracan fairy shrimp and other tadpoles, including members of the same species. This dietary switch, and the accompanying acceleration of development, might explain why these toads are among the few amphibians to invade the deserts of the American Southwest, where they breed in highly ephemeral rain-filled pools that are often rich in shrimp and tadpoles. My doctoral advisor and his students have been studying spadefoots for 30 years, so we already knew much about their ecology, evolution, and development. Our observations of tadpoles of the eastern spadefoot toad (Scaphiopus holbrookii; a species that is common in the Eastern U.S., but that does not produce the distinctive carnivore morph found in Spea), showed us that this species will just as happily cannibalize other members of the same species as it will eat plant material. We wondered if such facultative carnivory, if present in an ancestral species, could have served as the springboard for the eventual evolution of the specialized carnivore morph present in Spea. As a formal test of our hypothesis, we exposed tadpoles of Sc. holbrookii to a novel diet (for this species)—shrimp—and determined how their morphology and gene expression changed. In this way, Sc. holbrookii served as proxy for the ancestor of Spea (the genus that develops the carnivore morph). To help us with these studies, we recruited Andrew Isdaner, who was volunteering in the lab (and who has subsequently decided to join our lab as a beginning Ph.D. student). Our controlled experiments revealed that both morphological and molecular aspects of Sc. holbrookii changed in a manner consistent with changes observed in extant Spea. However, the changes were not nearly of the same magnitude nor did all features change in the expected direction. Nevertheless, these experiments told us that Spea’s ancestor likely harbored diet-dependent plasticity that selection could refine. We then performed a similar experiment using Spea multiplicata tadpoles to explore the extent of adaptive refinement of the carnivore morph. In contrast with the mixed-bag of plasticity observed in Sc. holbrookii, Sp. multiplicata showed a coordinated plastic response in its trophic morphology that allowed it to grow equally well on shrimp and detritus. These results, in combination with those from Sc. holbrookii, gave us confidence in the plasticity-first hypothesis for the evolution of the carnivore morph. However, we felt a contrast between two species might not be sufficient to demonstrate directionality and adaptive refinement. 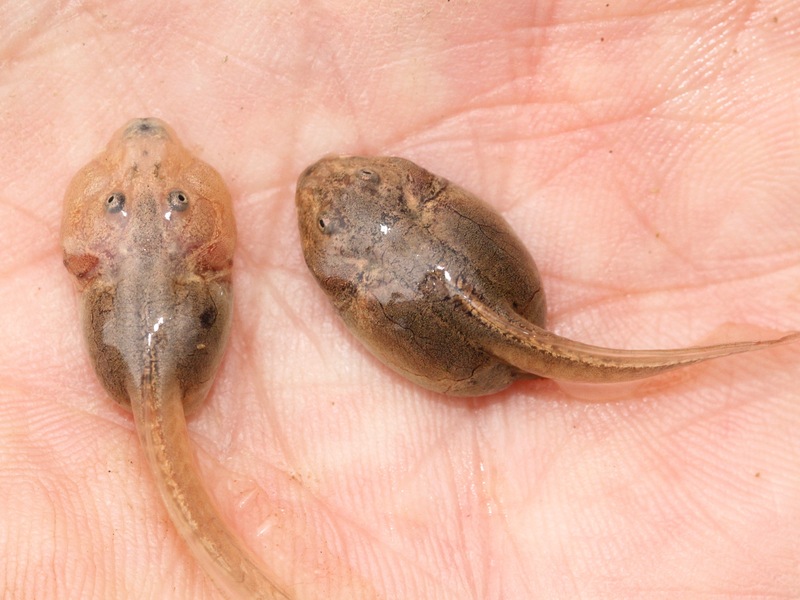 Wild-caught Spea multiplicata carnivore (left) and omnivore (right) tadpoles from southeastern Arizona. Therefore, to “beef up” the story, we measured gene expression of wild-caught Sp. 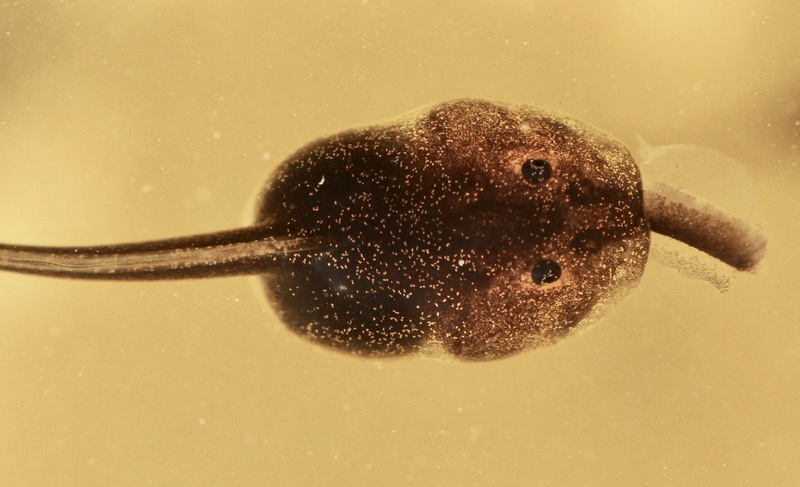 multiplicata tadpoles. We also performed morphological comparisons among wild-caught carnivores from lineages that differ in frequency of carnivore morph expression. First, we found that expression level of metabolic genes adaptively correlated with magnitude of carnivore phenotype expression: more carnivore-like individuals had greater expression of a peptidase and lower expression of a lipase and amylase. Second, we discovered that lineages that express the carnivore phenotype more frequently produce carnivores with more exaggerated features than lineages that express the phenotype less frequently. This observation validates a fundamental prediction of plasticity-first evolution (and arguably of evolution by natural selection more generally) in that the degree of adaptive refinement is positively related to frequency of trait expression. 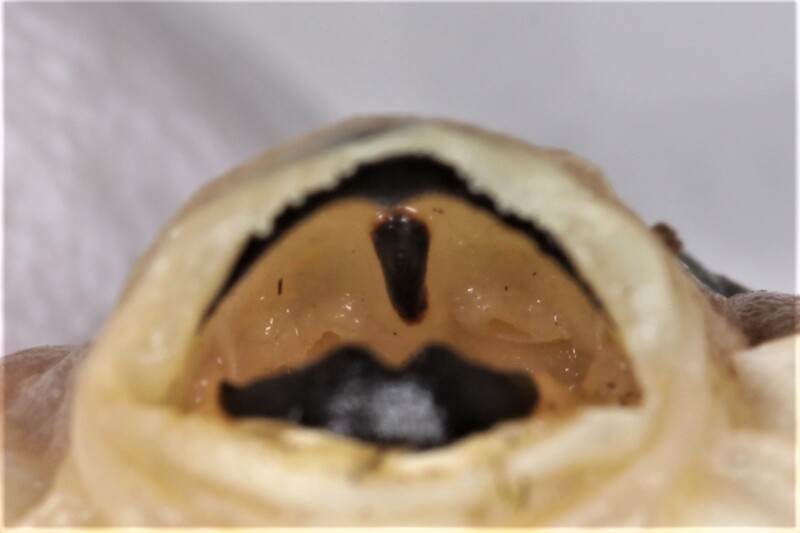 During this comparison among wild-caught carnivores, we were excited to discover a previously undescribed carnivore trait—a keratinized spike descending from the tadpole’s palate. We hypothesize that this palate spike aids in prey capture and/or consumption. This palate spike was only observed in Spea tadpoles (and not Scaphiopus) and the magnitude of its development positively co-varied with magnitude of carnivore phenotype expression. Importantly, we were unable to induce this spike by altering an individual’s diet, suggesting a lack of pre-existing plasticity for this trait; instead we hypothesize that its production is underlain by taxon-specific (de novo) mutations. Taken together, all of these observations point to a prominent role for plasticity in jumpstarting the evolution of the novel carnivore morph. They also suggest that existing variation worked in conjunction with de novo mutations to produce the refined carnivores seen in Spea today. Thus, this study stands as one of the few to have provided support for plasticity-first evolution in a complex trait found in natural populations.